Well, who'd'ha thunk it? 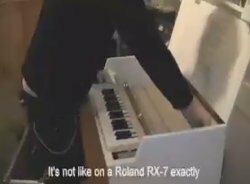 After years of sample use (see below), Opeth have done the reverse of most bands and sourced a real Mellotron (a MkVI in this case) for their latest opus, 2011's Heritage. Their first release after a three-year gap, the album finally breaks the mould and loses the last traces of the band's metallic past. That isn't to say it lacks heaviosity - it gets quite crunchy in places - but it's more progressive hard rock than metal, particularly on the vocal front, Mikael Åkerfeldt's 'cookie monster' finally consigned to oblivion, hopefully for good. Stylistically, the opening title track is an ostensibly 'classical' piano solo with the occasional jazzy touch to keep us on our toes, while we get touches of Rush in I Feel The Dark, choppy Clavinet work on Nepenthe and Crimsonesque riffery on several tracks, amongst other progressive tropes. Highlight? Possibly instrumental closer Marrow Of The Earth, a beautiful clean electric/acoustic guitar duet, although there isn't actually a bad track on the album, the two bonus tracks on the limited CD/DVD set included. Now, just in case anyone's not convinced that this should be in this section, here are a few pics screenshotted (?! Screenshat??!) 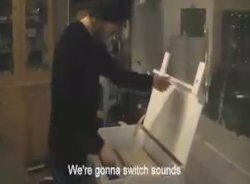 from the 'making of' DVD that comes with the deluxe version of the album. Argue with that and stay fashionable. As you can see (if you're looking closely enough), Åkerfeldt and Per Wiberg play a Swedish MkVI Mellotron, in Wiberg's last appearance with the band; the head falling from the tree on the rather naff sleeve is his. We get strings and flutes (and choir?) on The Devil's Orchard, flute, strings and raucous brass on I Feel The Dark, what sounds like distant oboes and obvious strings on Häxprocess, strings and flutes on The Lines In My Hand, with a major flute part a couple of minutes in, with a similar moment in Folklore, plus more strings and choirs. On the bonus tracks, Pyre is stuffed with flutes, with strings all over the gorgeous Face In The Snow. All in all, then, slightly duff sleeve aside, congratulations, gentlemen: a triumph. More from Jim Rigberg. Jim originally wrote this review while we were under the impression the Mellotron was real; his amendments are italicised. I confess that I am not exactly up on the death/black metal scene in general, let alone the Swedish death/black metal scene that spawned Opeth, in particular. Accordingly, I cannot attest to how innovative Opeth truly is. However, lots of writers familiar with this genre have singled out Opeth as being on the cutting-edge, not merely of death/black metal, but of rock/metal, period. For this writer, at least, the one thing that piqued my curiosity was that Opeth are often cited as being huge progressive rock fans - particularly Genesis, Pink Floyd and King Crimson - and that their music actually exhibits these influences prominently. Well, I took a plunge and purchased Blackwater Park (music - ****/'death metal' type singing - negative*) - named after a German prog-band so obscure that Thompson probably hasn't even heard of them (Ed. correct!). The music on Blackwater Park is, to say the least, very interesting. The 'metal' portions of the songs are quite violent - the sonic assault created on the opening track sounds like air being sucked out of a room - but, as promised, these sections often seamlessly settle into beautifully melodic, haunting - even pastoral - 'soft' sections. The level of musicianship is top-notch; the sinister harmonies guitarists Michael Åkerfeldt and Peter Lindgren generate owe as much to the likes of Ceacescu and Sibelius as to anything else. Unfortunately, all too often, Åkerfeldt - who has a very nice voice when he wants to - engages in the ridiculous croaking that makes death-metal such as acquired taste. Meaning, I'm not buying any more of Opeth's 'standard' releases. Last year, however, Opeth released Damnation. Nary a shred of shred is to be found on Damnation. Instead, Damnation is Opeth's brooding prog-rock meisterwerk. It is uniformly excellent; the haunted melodies scattered throughout the 'soft' sections of Blackwater Park (and, undoubtedly, Opeth's other releases) - which all sound like they could be hammered into damn good songs in their own right - are brought to the fore and allowed to breathe. While gentle, with subtle jazzy hints here and there, the music remains powerful - highly evocative of the frozen wasteland that I imagine much of Sweden (sorry Swedish readers) to be. One warning, though - do not listen to this if you are feeling suicidal. Perhaps part of Damnation's charm is that it was produced by Mr. Porcupine Tree, Steven Wilson. Indeed, at times, Damnation sounds like the Tree with a different singer. Most importantly (from our perspective here, at least), is that Mr. Wilson was good enough to feature his trusty 'Tron on five of the release's eight tracks. The choir in the middle of Closure is nice, but fairly subtle. However, on the other four 'Tron tracks, the strings burst right out at you. Particularly strong is the descending string line in To Rid The Disease, which creates a pretty good idea of how Genesis would have sounded if all the members of the band were clinically depressed. Anyway, this a great CD/album. 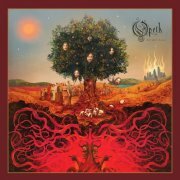 Hopefully, it marks a departure point for Opeth; more prog (hell, even more prog-metal), less death vocals. Definitely for Floyd/Porcupine Tree and 'Tron fans. Okay. I was fooled. Thompson has it on excellent authority that the 'Mellotron' on this CD is sampled. What a shame seeing as Steven Wilson produced this and has a real one he could have used. [Ed. No he hasn't.] On the other hand, I must say that the samples are very good; of particular note are the upfront Strings in To Rid The Disease. Hopefully, Opeth will continue moving in the direction Damnation has taken them and will use a real tape-replay machine next time round so as not to make nattering morons out of certain naïve reviewers. 2002's Deliverance predates Damnation by a few months; apparently, they were originally intended to be released together as a double, but Music for Nations got cold feet over the idea, thus ruining the concept. Anyway, it showcases their new fusion of styles effectively, mixing their earlier death metal side with more progressive sensibilities, although calling this 'progressive metal' is to do it a grave disservice. While much of the album grunts its way through complex-yet-extreme metal, there are enough moments of subtlety to keep the prog fan happy; A Fair Judgement is particularly good. Steven Wilson is credited with 'Mellotron', but all we get is a faint flute part on closer By the Pain I See In Others. Ghost Reveries is Opeth's eighth album, possibly the culmination of the experiments they began on Deliverance and Damnation, moving away from their roots into more interesting areas. Hours Of Wealth displays this fusion at its best, opening with a picked clean electric guitar part bolstered by 'Mellotron' flutes, sounding unlike anything else I've heard and absolutely nothing like Dream Theater et al, which is to be applauded. OK, so Mikael Åkerfeldt insists on getting some 'cookie monster' vocals in here and there, but they shouldn't affect your enjoyment of the album even if, like me, you consider them a little silly. Per Wiberg from Spiritual Beggars plays keys on the album; I presume it was him playing with the band when I caught them at a festival in Sweden earlier this year. He's credited with 'Mellotrons, organs, grand & electric pianos', with Åkerfeldt on 'additional Mellotrons' and although they're fakes, it's fair to say that there's a good bit of 'Mellotron' action scattered across the album. Plenty of strings, plus choirs and flutes in places, with a particularly effective string part at the beginning of Beneath The Mire and the previously-mentioned flutes on Hours Of Wealth. No other especial highlights, just a fair bit of sample-replay alongside Wiberg's other keyboard work. 2008's Watershed carries on in the same vein as its predecessor; have Opeth stopped progressing? I suppose they have the right, given that they've moved so far in a few short years... It's difficult to pinpoint highlights; pretty much every track shifts between 'absurdly heavy' and 'light as air', often turning on a sixpence, although Hex Omega is possibly the best example. But what's going on with the deliberately out of tune acoustic on Burden? Shedloads (sorry) of Wiberg's fakeotron, with strings, flutes and choirs everywhere you look, a good TTTT were it applicable. Incidentally, the special edition adds three bonus tracks: Derelict Herds, a (very good) version of Robin Trower's Bridge Of Sighs and a largely acoustic Marie Fredriksson (Roxette) cover, Den Ständiga Resan, with fakeotron strings on the first-named. Also incidentally, a radio edit of Burden was released as a single, backed with an Alice in Chains cover, Would? and a remix of Porcelain Heart, retitled Mellotron Heart, also initially available on a bonus disc with the album, which slathers fakeotron all over a considerably quieter version of the song. 2014's Pale Communion sees the band, if anything, moving even further from their old haunts, highlights including opener Eternal Rains Will Come, the lengthy Moon Above, Sun Below, cheekily-titled instrumental Goblin and gorgeous, string-laden closer Faith In Others, the kind of song that strikes despair into the hearts of trve metal types, unable to recognise genuine progression when they hear it. Joakim Svalberg plays keys, but the band have reverted to samples (spot the way-over-eight-seconds chord on River), with strings all over most tracks, plus flutes here and there, notably on Eternal Rains and Goblin, and 'fake real strings' on a couple of tracks. So; good, genre-busting albums from a band who have become more 'progressive' without losing their core audience, well worth hearing. Buy.